A symbol of past, present and future, three stone rings represent your love together. This stunning style maximizes sparkle and works with most diamond shapes. Show off your style with unique shapes or accents for a ring you'll love for a lifetime. 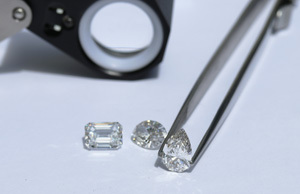 Ada diamonds will gladly set one of our lab diamonds in a temporary proposal setting so that your proposal can remain a surprise, then you can re-design your ring together as a team and apply the full cost of the original setting towards a new ring.